With over 25,000 species of orchids, you're likely to find a type of orchid that fits your color and size preferences. Because there are so many types of orchids, including plants that bloom once a year and others that can bloom several times, it is difficult to determine exactly when orchids in general are "in season." Keep in mind that outdoor-planted orchid bloom times may vary slightly from norms, based on sunlight and your local temperature. You can have orchids blooming in your home throughout the year. A winter walk through the nursery or home center might give you the impression that orchids are only in season at that time. However according to an article from Colorado State University, "with proper selection" you can have blooming orchids in your home yearlong. For example, phalaenopsis — sometimes called the moth orchid — tends to bloom only once a year, generally after two months of decreased temperatures and slightly decreased light. Extending the dormancy period of your orchid by reducing the water and light it receives may extend periods of blooming and let you stagger blooms throughout the year. The length of bloom time for your orchid depends upon the type of orchid you have. For example, Phalaenopsis often lasts six to 12 weeks. Lady Slippers last about six weeks. Cattleya blooms often last just a few weeks. Often, the care you give the orchid and the conditions it is kept in determine how long the plant blooms. Keep your orchids blooming for as long as possible by using a blossom-booster fertilizer as soon as the flower spikes, continuing through the time that the last bud opens fully. Since orchids thrive in humid conditions, mist the stems and leaves daily or move the plant near other potted plants to give it more moisture. Position your orchid in a south-facing window where it receives adequate indirect light. Most orchids have medium green leaves when they receive proper light levels. 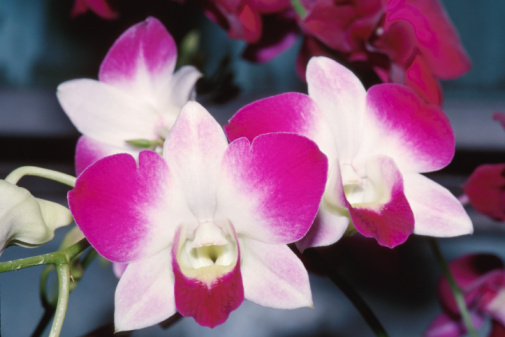 When buying growing orchids at the home center or floral department, look for plants that are only partially blooming, suggests the Argus Orchids website. Partially blooming plants with about half their blooms open assure you longer-lasting bloom times in your home; heavy blooming plants are often on the downside of growth and blooming.